Performance is a common metric that is measurable and a key differentiator across businesses, people and products. The built environment has a significant role to play in enhancing employee productivity, and research has shown that employee productivity is directly linked to the environment in which people function. The Center for Building Performance and Diagnostics at Carnegie Mellon University has identified studies that prove that good lighting can enhance individual productivity by 6.7–23 percent. Noise, thermal comfort and indoor air quality (CO2 levels, total VOC levels) are some of the key performance indicators that have a direct impact on human productivity. 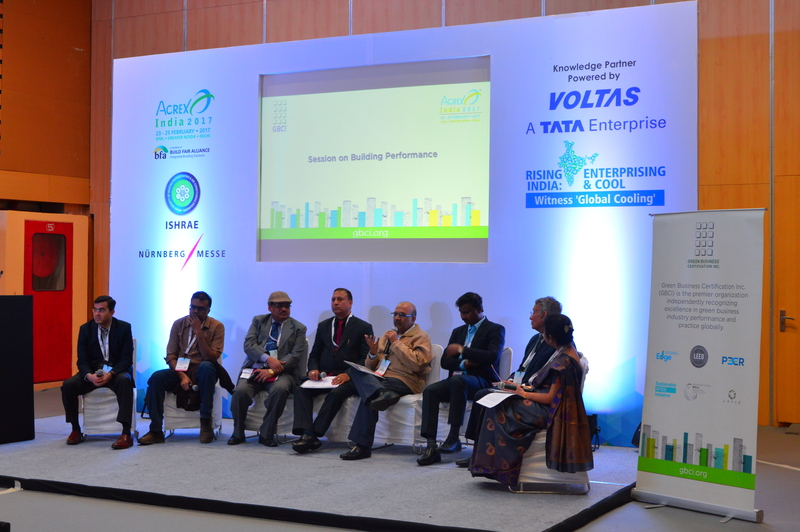 The need for buildings to perform better to improve profit margins and to provide better comfort to employees or customers was highlighted by panelists in a discussion organized by GBCI in New Delhi, on Feb 25., against the backdrop of ACREX India 2017, the largest global platform for the HVAC&R industry. The discussion on performance tracking and the role of data to enable informed choices was held between a set of seven LEED users from the corporate, public, consulting and service sectors, as well as major operators for mass rapid transit systems. According to all the panelists, building performance is not limited to energy and water efficiency, and level of service is tied closely to performance. A building may be energy-efficient, but if it fails to meet thermal and visual comfort of occupants, then it is not a high-performing building. Kamal Meattle, owner of one of the greenest buildings in New Delhi, Paharpur Business Centre, believes in monitoring for continuous performance improvement. He has proven data to demonstrate that occupants of his building have improved cognitive functions. The PBC building uses a large number of plants to improve and maintain good indoor air quality. Delhi Metro Rail Corporation and Delhi International Airport Ltd. operate some of the largest transit systems in India. DMRC handles 2.7 million passengers daily in its metro network in the national capital region, and the T3 terminal in Delhi has a passenger load of 34 million annually. Catering to the comfort of a large number of passengers with varying needs and tracking this data to improve service is the key goal in these transit systems. Any decision on greening the facilities is driven by profitability, and “green” makes business sense, according to A.K. Gupta, Director, Electrical, DMRC, and M. Muthukrishnan, Head, Environment, DIAL. As the eighth largest airport in the world, spread across 5.3 million square feet and with a footprint of 34 million passenger annually, Indira Gandhi International Airport uses Arc to help the T3 operators and stakeholders measure their performance score in the areas of energy, water, waste, transportation and human experience on a daily basis. Data makes a decision actionable. The Arc platform provides a variety of data analytics, such as present and historical energy and water consumption, waste diversion from landfill and the experience of occupants. It also provides peer comparison at local, regional and global levels. Arc helps facilities managers of existing buildings track and improve performance and helps building owners make decisions on retrofit options. Data must be meaningful and connected to business metrics, says Tanmay Tathagat, environmental consultant. According to Tathagat, one of the largest IT companies in India tracks energy consumption per employee on an ongoing basis, and it is directly linked to business performance metrics. The Indian Farmers Fertilizer Cooperative Ltd. (IFFCO) maintains and records data on environmental performance improvement for all its properties, and has carried out several retrofits, such as improved cooling towers and demand-controlled ventilation, based on data analytics. Human expectations for buildings and indoor spaces are changing with the times, and performance tracking helps in managing people’s expectations. A performance pathway to LEED certification, using the state-of-the-art Arc platform, is a dynamic and responsive method for mapping and meeting human expectations and achieving a greener environment. Expectations from the user community have changed over the years, and performance monitoring and tracking is a very powerful tool to measure user satisfaction in a space. LEED certification provides a quantifiable metric to record performance improvement in buildings. It has helped define portfolio level benchmarking and improvement opportunities to several corporate organisations. Indoor environmental quality has direct links to cognitive function and employee productivity. Data allows action to be taken. It also helps in peer comparison and enables healthy competition among peers. Cost-benefit analysis drives design and retrofit decisions, and green design has proven to be economically beneficial.